Turns out he was trying to escape. On Friday, police identified the man as Mike Delahunt, who is “infamous” in the area (Moncton, New Brunswick) for having assaulted people who asked him to stop golfing in a public park. Delahunt seems to have stayed out of the spotlight after serving his sentence for those incidents, which took place in 2013. But that ended last week, when he allegedly fled from the scene of a domestic-violence incident and, for whatever reason, made floating down the river on a chunk of ice a part of his escape attempt. So let’s go back to these golf assaults for a second. 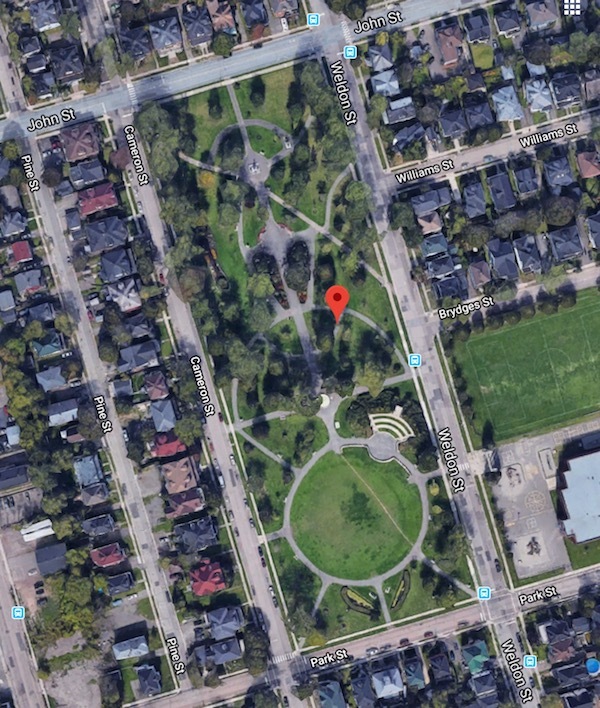 Delahunt apparently enjoyed whacking golf balls around in Victoria Park, a downtown park that is just a block wide and, at least in a satellite image, does not look remotely suitable for any club other than a putter. Residents had been complaining for weeks about Delahunt’s golfing when Fred Leidemer approached him in September 2013 to object, after his wife was nearly hit by a golf ball. At the end of that interaction, Leidemer had a broken arm and a missing tooth. Delahunt later pleaded guilty to that assault and to making death threats against another guy who complained, and was sentenced to two years of house arrest and probation. That might have been a little light, especially given these new allegations. Police said they responded on Thursday morning to a domestic-violence complaint by an unidentified woman, but found her assailant had fled. A police dog led them to the river bank, but the trail ended there. But shortly thereafter, “a man was spotted on a large piece of ice floating down the river,” and police decided that was probably their suspect. As you may recall, I enjoy tales that involve attempted escapes by water, because they are almost always doomed to failure. This is usually because a person on or in the water is necessarily much less mobile than pursuers on land. See, e.g., “Police Wait Patiently for Man in Pond to Surrender” (July 24, 2014); “Sinking Pedal Boat Ends Ridiculous Escape Attempt” (Jan. 28, 2010). Although those are not the only problems an aquatic escapee can run into. See, e.g., “Bad Places to Hide: Island in Alligator-Infested Lake” (Mar. 30, 2016). Delahunt didn’t have to worry about alligators, but that’s because unlike him they are smart enough to stay out of Canadian rivers in February. It was well below freezing that morning in Moncton, and I don’t know what the water temperature was but the presence of ice big enough to stand on suggests it was pretty goddamn cold. Also, while floating down a river is usually not good for escaping because it’s slow, that may not have been the case here—this video clip suggests the current was carrying him along at a pretty good clip, relatively speaking, though I wouldn’t say he was “speeding down the river” as the CBC claimed. That river is also subject to scary “tidal bores,” caused by high tides pushing upstream against the current, causing the kind of turbulence that could easily knock an alleged abuser right off his ice floe. These are some of the reasons the RCMP officer noted that Delahunt is probably lucky to be alive. And even if this river flows faster than some, it suffers from the other problem with rivers as a means of escape: everybody knows where you’re going. All they have to do is follow along, walking or driving as the case may be, until you wash up somewhere. Or end up out at sea, I guess, in which case you might end up being pursued by something a lot scarier than the Mounties. Having survived the experience, Delahunt was charged with six crimes including assault and breach of probation, which may mean he hadn’t entirely finished serving his sentence for the golf-related violence. It definitely suggests the anger-management classes he was ordered to take didn’t quite do the job.